Outdoors in The Adams Theater at The Utah Shakespearean Festival in Cedar City, "The War of the Roses" is an adaptation of the three Henry VI plays. Howard Jensen trims over 9500 lines down to around 2800 lines for one three hour play. He strips away all of the ancillary scenes, some of which are very good, but not necessarily germane to the story of The War of the Roses, which takes place entirely within these three plays. Richard II, and the Henry IV and V plays lay the foundation, Richard III is like an epilogue. Jensen's play is a telling of this brutal period of English history in a concise line from start to finish. The Henry VI plays were the first serious works by the young Shakespeare who was still learning his craft. They have a swagger to them that is characteristic of the young artist who is confident of his message, but not his ability present it. There's none of that in the Henry IV plays where he's a confident master, but that swagger is preserved here. There's almost nonstop action from start to finish. We open with the coffin of Henry V to "Hung Be the Heavens With Black." He had conquered France, and we go directly there. Talbot has been terrorizing the French, but he's defeated in battle by Joan of Arc. She doesn't kill him, though, saying "Thy hour has not yet come." When that hour does come, she kills him, but in the meantime events have come about that will free France and divide the English. Richard Plantaganet has laid out his claim to the throne as third son to Edward III. Henry restores his inheritance and makes him Duke of York. He and Somerset quarrel, he picks the white rose of York, and Somerset the red rose to represent Lancaster as the two claims to the throne. Somerset fails to aid Talbot because of this and the nobles choose their sides. Humphrey, Duke of Gloucester is protector to this young King. He has arranged a state marriage with a big dowry and political advantage for Henry, but Suffolk convinces him to marry Margaret of Anjou, with whom Suffolk is in love. Instead of getting a dowry, Henry gives her father Anjou and Maine, and withdraws from France. The nobles plot the downfall of Gloucester who says "Mine is but the prologue to their play." Each has his own ends, and Humphrey is accused of treason, arrested by Suffolk, who now controls the Queen, who controls the King, and thus controls the throne. Henry objects, but he doesn't have a chance against them. York is given an army and sent to Ireland to get him out of the way. He observes "It's men I lacked and you will give them to me." Gloucester is murdered in his bed. Suffolk and Winchester are accused by Warwick, who is backed by the commons, and Suffolk is banished and killed. Margaret raves as she carries her lover's head and holds it to her breast, screaming. Richard returns from Ireland and claims the crown. Henry's claim is weak, and he relinquishes it to Richard's heirs after he dies. Margaret picks up arms with the northern lords, and Henry is abandoned by all. Corliss Preston is a swaggering, taunting Margaret, when York is captured. She gives him a handkerchief dipped in his young son Rutland's blood to wipe his face. They put a paper crown on him and make him kneel on a mole hill before Clifford kills him. Seeing York's head, Henry prophesies "Things ill got have bad success." Plantaganet's son becomes King Edward IV. During the ensuing battle Henry comes to Richard's mole hill and contemplates the horrors of war. The son who has slain his father comes there, then the father who has slain his son. Edward has spurned Warwick's match, marrying him to the sister of the King of France so he could marry Lady Elisabeth Grey. Warwick joins with Margaret, but both are defeated. Margaret's son is brutally killed in front of her, but the sons of York won't kill her. Henry's reading his bible in The Tower of London. Richard, who is plotting to become Richard III comes and kills him. We learn of his prophecy as one who was born feet first, with a hunchback and teeth..."to snarl and bite and play the dog." The cast is a veritable who's who of Ashland veterans. Corliss Preston was an absolutely riveting Margaret. She starts out innocent enough, but we see that edge right off. She becomes a fearlessly domineering Queen, while she has a none too secret affair with Suffolk. After his death she's a mighty warrior, until she meets her fate as a raving madwoman. She captures all the venom of a Margaret who is one of the most ruthless women in history. Rick Hamilton is a strong York. He's experienced in this role and plays it with elegance, power, and passion. Mark Murphey's Warwick is smooth and confident. He makes Kings because he patiently observes and times his moves perfectly. Anthony de Fonte is a powerful Gloucester, and Raymond L. Chapman, the slow witted Henry. Michael A Harding is an outstanding Richard. He moves with the gait of the deformed son of Plantagenet. He's certainly bitter, and everything about him is venomous. He's strong and sure in battle, though, and sly and quick witted enough to be a constant threat to anyone in the path of what he wants. That turns out to be a lot of people, too. 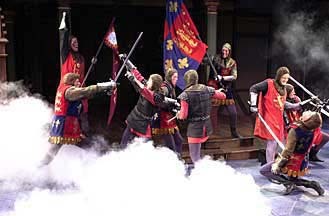 "The War of the Roses" is a traditional production with beautiful sets and costumes. It continues outdoors on The Elizabethan stage at The Adams Theater through September 1 at The Utah Shakespearean Festival in Cedar City.